This protein A purified monoclonal antibody was produced after repeated immunizations of balb/c mice with rhodamine conjugated KLH. The molecular formula of 5-carboxytetramethylrhodamine, succinimidyl ester (5-TAMRA, SE)is C29H25N3O7 The molecular weight of 5-TAMRA, SE is 527.53 This product contains 0.01% (w/v) Sodium Azide preservative. Our Abpromise guarantee covers the use of ab9093 in the following tested applications. Dot Blot - Anti-Rhodamine antibody [11H10] (ab9093)This image is courtesy of an anonymous abreview. Publishing research using ab9093? Please let us know so that we can cite the reference in this datasheet. Does this ab cross react with texas red? ab9093 does not recognize texas red. 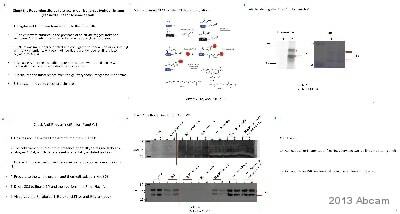 Below is my review of the abcam antibody ab9093. I have also attached an image to this email with my data. A dilution series of two TAMRA labeled peptides were bound to a PVDF membrane using a dot blot apparatus. Peptide #1 is conjugated directly to TAMRA via an amide bond whereas peptide #2 contains an aminohexanoyl linker between the TAMRA and the peptide. Also note that the peptides differ in sequence and in length, peptide #1 has 15 amino acids and peptide #2 has 29 amino acids. A dilution series for each peptide was made starting with approximately 0.5 nmoles of peptide and followed by a series of 1:2 dilutions. After binding of the peptides to the PVDF membrane, the membrane was then blocked in 5% milk in 1X TBST for 1 hour at room temperature. The membrane was then incubated in with the ab9093 antibody at a 1:2000 dilution in 5% milk in 1X TBST for 1 hour at room temperature. Following incubation with the primary antibody the blot was then washed 3 times in 1X TBST and then incubated with a 1:10,000 dilution of an anti-mouse-HRP secondary antibody for 45 minutes at room temperature in 5% milk in 1X TBST. The blot was then washed 3 times with 1X TBST. The dot blot was imaged by incubating the membrane in 1 mL of SuperSignal West Femto Chemiluminescent substrate from Thermo Scientific for 1 minute. The blot was then exposed to film for 1 minute and then developed. The results show that the ab9093 antibody is able to detect peptide #2, but not peptide #1 on a dot blot. I think this suggests that a linker between the fluorophore and peptide is required for detection of the fluorophore when it is directly conjugated to a peptide. This might indicate that the antibody is unable to react with the fluorophore on peptide #1 due to steric hindrance by the peptide. Please let me know if you have any questions or if you need any other information from me. I would prefer for my abreview to be anonymous. Thanks. Thank you for submitting your image and experimental details. I have no published your review on our datasheet and awarded you 220 Abpoints. The following testing discount code is active and can be used to receive a free primary antibody on a future order before November 13th, 2012: ***. Please let me know if you need any additional assistance. I would like to test ab9093 on rhodamine tagged peptides in dot blot. Thank you for your interest in testing ab9093 in dot blot. Typically, researchers can submit a product review via an online submission form. At this time we do not have an Abreview form available for submitting reviews for this application. As an alternative, please send your review of 9093 to me by replying to this email. Regarding your image, please note any descriptive details that will help other researchers interpret your results. You will be awarded the same number of points as if you had submitted the review online using a standard Abreview form. You will receive 120 points for text with an additional 100 points for including an image. These points can be used for discounts on future purchases or Amazon gift cards. I will also send you the testing discount code once I receive your review. This discount code will be worth one free antibody off of a future purchase. For further information regarding Abreviews, please see https://www.abcam.com/index.html?pageconfig=resource&rid=10332. Thanks in advance for submitting your review. Feel free to contact me if you have any further questions. Yes, I would be using this antibody to stain cells. I am very pleased to hear you would like to accept our offer and test ab9093 inICC/IF. This code will give you 1 freeprimary antibodybefore the expiration date. To redeem this offer, please submit an Abreview forICC/IF and include this code in the “Additional Comments” section so we know the Abreview is for this promotion. For more information on how to submit an Abreview, please visit the site: www.abcam.com/Abreviews. I would like to inquire as to whether I would be eligible for the testing discount program. I would like to purchase the anti-rhodamine antibody and use it for immunofluorescence but the data sheet does not indicate whether it will be successful for this application. I was referred to you from customer service (please see email below) and was hoping that I could get a discount to try this antibody for my purposes. If it works, we would be consistently ordering this antibody. I would just like to confirm if you will be using this antibody to stain cells or tissue sections. When this antibody binds to the dye, does it quench the signal? What is the quenching efficiency for rhodamine? I heard back from the lab that unfortunately they do not have any information regarding rhodamine quenching by ab9093. Since this is not something we typically test, I am unsure if any of our anti-dye antibodies have been tested in this way. If they have, that information will be on the datasheet. I'm including some links to our tags, conjugates, and EasyLink kits in case they are helpful. I am sorry that this information could not be more helpful, but please let me know if you have any other questions. Since the abcam guarantees it will detect lissamine rhodamine if used for IHC, will we be refunded if it does not work? Thank you for your reply. Yes, this antibody will be covered under our Abpromise guarantee for detection of lissamine rhodamine in IHC-P. If you have any problems using it, please contact us within six months and we will be happy to replace or refund your purchase. Thank you for your reply. We only have full size vials of all our antibodies, so we do not have small samples to send out for tests. However, since this antibody is supposed to recognize rhodamine derivatives, we will guarantee it to work against the lissamine rhodamine derivative in the tested applications ELISA and IHC-P. I hope this information is useful, but let me know if you have any further questions. Does this antibody detect lissamine rhodamine (also called sulfo-rhodamine B)? Thank you for your call yesterday and for your patience while I have looked into your enquiry. Ab9093 was raised against TRITC and reacts with rhodamine isomers 5 and 6, TAMRA, and TRITC, but it does not react with Texas Red. Unfortunately it has not been tested against sulfo-rhodamine B so we are not sure if it will recognize this derivative. I am sorry that I don't have an exact answer for you. Please let me know if you have any further questions or if there is anything else we can do for you.